A 19-year-old male is brought to the emergency department following a gunshot wound to the chest. According to the first responders, the man was found unresponsive and was quickly intubated in the field. A physical examination demonstrates decreased lung sound on the right field and a thoracostomy is quickly performed. The chest tube immediately drained 1600 mL of reddish fluid. (M2.PL.4799) A 45-year-old male presents to the emergency department by ambulance from a motor vehicle accident. The emergency medical technician states that the patient had been the driver and was hit on the driver’s side while crossing over the intersection. The patient will open his eyes and withdraw from pain and but can only make sounds with no coherent words. The patient’s temperature is 97°F (36.1°C), blood pressure is 98/63 mmHg, pulse is 112/min, and respirations are 24/min with an oxygen saturation of 94% on 15 L/min O2 via a non-rebreather mask. Upon physical exam, you note reduced breath sounds on the left. 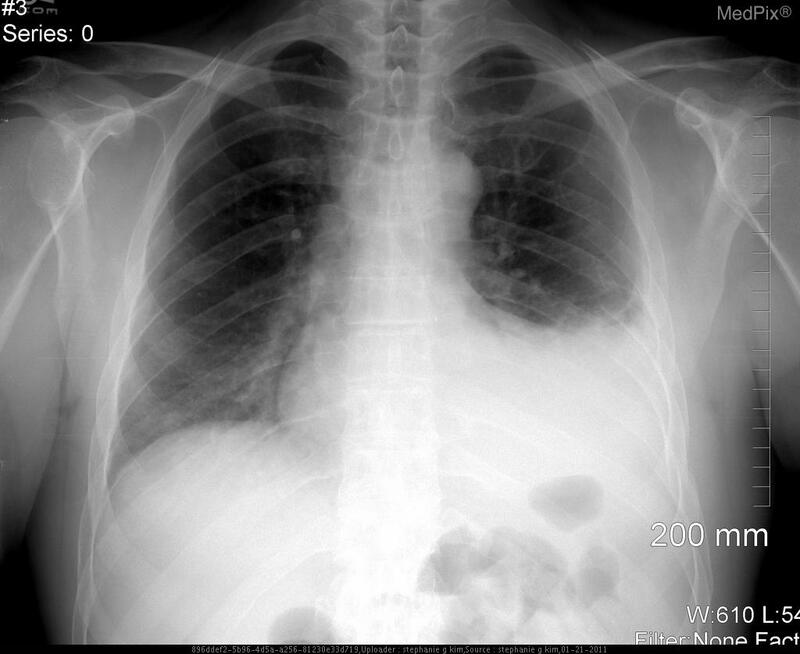 The patient is stabilized and a chest radiograph is obtained, as shown in Figure A.